Brine—that wonderful liquid you might find in a martini, or accompanying a shot of whiskey as part of a pickle back—is also harmful to the environment. In fact, how to dispose of vast amounts of brining salt is one of the biggest problems facing the pickling industry. But the USDA may have just uncovered a solution. So, what’s so bad about a little extra salt in the earth or the ocean? Our diets and our weather––cold winters mean more salt on the road––have led to an increase in sodium chloride use. It finds its way into the groundwater, eventually making its way into our lakes, ponds, streams, wetlands—and drinking water. In addition to the big picklers (Claussen, Vlasic, Del Monte), small-batch brands like Rick’s Picks, the People’s Pickles and Brooklyn Brine, to name just a few, are reviving our collective passion and consumption of pickles. To tackle the negative effects of this pickle boom, Ilenys Pérez-Diaz and Suzanne Johanningsmeier, both scientists in the Agricultural Research Service (an arm of the USDA) are investigating the replacement of brining salt with calcium chloride, a compound that can be a beneficial soil amendment. 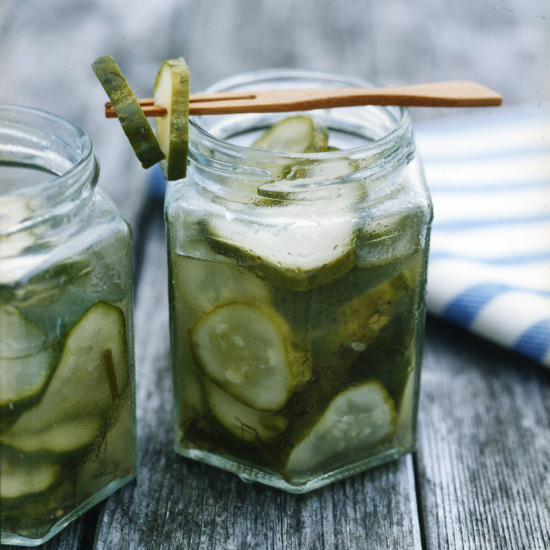 When the team tested calcium chloride in brine, they found that pickles retained their ideal snappiness, but leaving out the salt quickened the arrival of bacteria that lead to spoilage. They fixed the glitch by adding sodium benzoate, fumaric acid and horseradish extract––already known for its antifungal properties. The updated formula lowers sodium chloride waste from brine by 80 percent. Mt. Olive Pickle Company, the largest independent pickler, offered to help the lab to test these ideas. And they worked. By 2013, Mt. Olive was safely transforming roughly 66,000 bushels of calcium chloride–fermented cucumbers into dill chips, sour pickles, and radish and salad cubes. The research findings are featured in the July 2014 issue of Agricultural Research magazine. The group continue to make gains on their top issue. Pérez-Diaz, tells FWX that she just returned from the midwest after transferring the sodium chloride free cucumber fermentation technology to 5 more processors in the region. They're also working to apply the calcium chloride advances to gherkin pickles that are imported from India. Maybe soon the whole pickle world will be green in more ways than one.